Renal inflammation has a key role in the onset and progression of immune– and nonimmune–mediated renal diseases. Therefore, the search for novel anti–inflammatory pharmacologic targets is of great interest in renal pathology. JQ1, a small molecule inhibitor of bromodomain and extraterminal (BET) proteins, was previously found to preserve renal function in experimental polycystic kidney disease. We report here that JQ1–induced BET inhibition modulated the in vitro expression of genes involved in several biologic processes, including inflammation and immune responses. Gene silencing of BRD4, an important BET protein, and chromatin immunoprecipitation assays showed that JQ1 alters the direct association of BRD4 with acetylated histone–packaged promoters and reduces the transcription of proinflammatory genes (IL-6, CCL-2, and CCL-5). In vivo, JQ1 abrogated experimental renal inflammation in murine models of unilateral ureteral obstruction, antimembrane basal GN, and infusion of Angiotensin II. Notably, JQ1 downregulated the expression of several genes controlled by the NF-κB pathway, a key inflammatory signaling pathway. The RelA NF-κB subunit is activated by acetylation of lysine 310. In damaged kidneys and cytokine–stimulated renal cells, JQ1 reduced the nuclear levels of RelA NF-κB. Additionally, JQ1 dampened the activation of the Th17 immune response in experimental renal damage. Our results show that inhibition of BET proteins reduces renal inflammation by several mechanisms: chromatin remodeling in promoter regions of specific genes, blockade of NF-κB pathway activation, and modulation of the Th17 immune response. These results suggest that inhibitors of BET proteins could have important therapeutic applications in inflammatory renal diseases. All cells in an organism contain the same genetic information, but the gene expression pattern varies between cell types. Epigenetics involves heritable changes in gene expression that are not associated with DNA sequence modifications. Epigenetic mechanisms, especially DNA methylation and histone modifications, are dynamic processes and mediate the diversified gene expression profiles in normal and diseased states. Some of these epigenetic marks are being characterized in acute and chronic renal disease and could help explain gene expression regulation patterns in injured kidney. Oxidative stress, proinflammatory cytokines, and uremic toxins might induce epigenetic modifications involved in alterations of immune response, fibrosis, and cardiovascular disease in patients with renal disease.1–4 These modifications are potentially reversible, presenting an opportunity for identifying novel therapeutic targets. Two potent BET inhibitors, I-BET and JQ1, have recently been developed.5,22 These small molecules compete for the bromodomain binding pocket and displace BET proteins from binding to acetylated lysine residues. Several studies have shown that these compounds strongly inhibit malignant cell growth by targeting cancer-promoting genes.23–27 Initial studies in midline carcinoma and hematologic malignances showed that BET inhibitors induce release of the BRD4-NUT oncoprotein and the transcriptional suppression of MYC and BCL2 proto-oncogenes.28 Two human phase 1 clinical trials in patients with cancer are currently in progress.8,29 In vitro evidence in nonmalignant cells suggests that BET inhibitors could be a potential therapeutic option for inflammatory diseases. In activated macrophages, JQ1 and I-BET reduced inflammatory gene production in response to LPS.22,30 In synovial fibroblasts of patients with rheumatoid arthritis, I-BET suppressed proinflammatory factors and diminished their capacity to recruit immune cells.31 In a murine model of collagen-induced arthritis, JQ1 reduced inflammation and joint damage.32 JQ1 also ameliorated bleomycin–induced murine lung fibrosis33 and cardiac damage in a mouse model of pressure overload–induced left ventricular hypertrophy.34 A recent study reported that JQ1 delayed cyst growth and preserved renal function in a murine model of polycystic kidney disease by inhibiting c-Myc gene and cystic epithelial cell proliferation.35 Our aim was to investigate whether BET inhibition could modulate experimental inflammation in the kidney, investigating potential mechanisms involved. 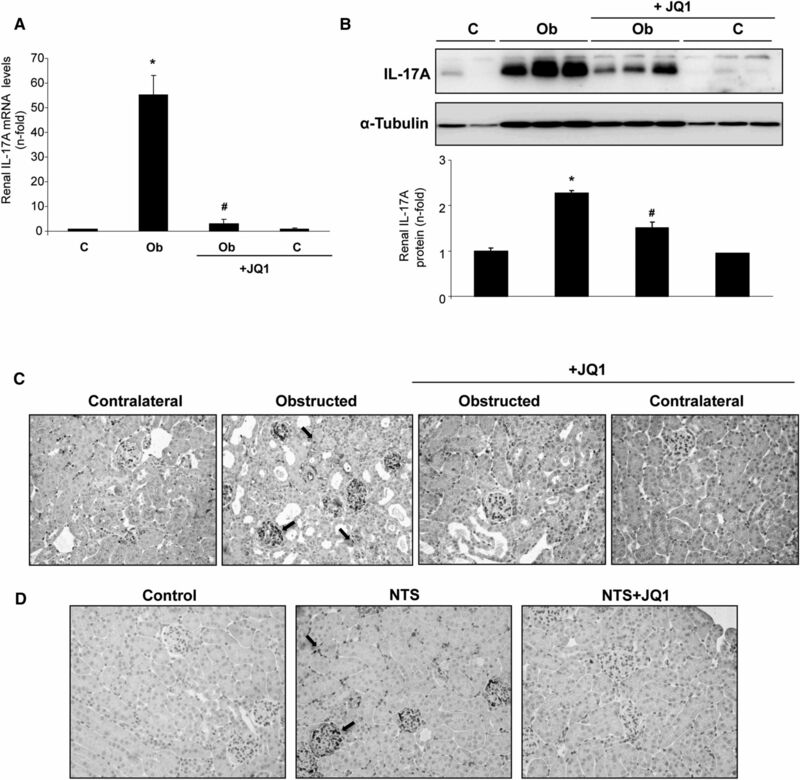 The anti-inflammatory properties of the BET inhibitor JQ1 were evaluated in vitro in human tubular epithelial cells (HK2 cell line) after TNF-α stimulation. This well characterized inflammatory cytokine regulates many proinflammatory genes and is involved in experimental and human kidney diseases.36 In HK2 cells, TNF-α stimulation upregulated gene expression of the proinflammatory factors CCL-2, CCL-5, and IL-6 for up to 6 hours, peaking around 3 hours. JQ1 dose dependently diminished overexpression of these genes (Figure 1A). The enantiomer (−)JQ1 had no effect, indicating the specificity of the response to active JQ1 (Figure 1A). Interestingly, BRD4 gene or protein levels were not altered in cells treated with JQ1 compounds, suggesting that BET proteins activity was independent of changes in their expression (Supplemental Figure 1A and B). In addition, similar results were observed with another BET inhibitor (I-BET 762) (Supplemental Figure 2). Next, we investigated the transcriptional pathways altered by BET inhibition using a whole–genome gene expression array. Global gene expression analysis showed that 210 probes (corresponding to 193 genes) were regulated after TNF-α stimulation, of which 155 (73.8%; 139 genes) were upregulated and 55 were downregulated (26.2%; 54 genes) (Figure 1B). 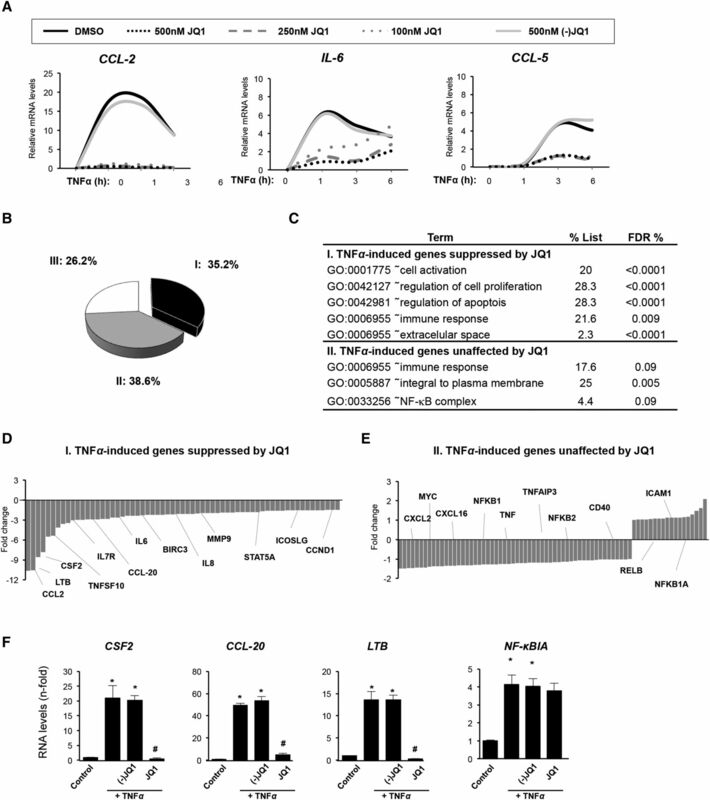 Among TNF-α–inducible genes, 74 probes (35.2%; 62 genes) were diminished by JQ1, whereas 81 probes (38.6%; 77 genes) were unaffected (Figure 1B). Functional pathway analysis revealed that JQ1 modulated the expression of genes related to cell activation (CSF2, IL-6, IL-8, LTB, and STAT5A), cell proliferation (SMAD3, CCND1, and ICOSLG), apoptosis (BIRC3, BCL3, and TNFSF10), and immune response (CCL-2, CCL-20, and IL-7R) (Figure 1, C and D). Conversely, the expression of some chemokines (CXCL-2), adhesion molecules (ICAM1), and immune-associated genes (CD40 and TNF-α) was unchanged after JQ1 treatment (Figure 1E). In contrast to observations in cancer cells and cystic epithelial cells,15,35,37 c-Myc expression was not changed by JQ1 in renal cells as described in the heart or the hematopoietic differentiation of stem cells.38,39 JQ1 did not modify certain genes of the NF-κB pathway (NF-κB1A, RelB, NF-κB2, and NF-κB1). Some of these data were corroborated by quantitative RT-PCR (Figure 1, A and F). The role of BRD4 in TNF-α–mediated proinflammatory gene regulation was evaluated by gene silencing. Transfection of HK2 cells with small interfering RNA (siRNA) specifically targeting BRD4 but not with scramble siRNA significantly reduced gene upregulation of IL-6, CCL-2, and CCL-5 caused by TNF-α (Figure 2). To determine whether JQ1 alters the direct association of BRD4 with acetylated histone-packaged promoters, chromatin immunoprecipitation (ChIP) assays with an anti-BRD4 antibody were performed. In the presence of the nonactive control (−)JQ1, BRD4 is robustly associated with the CCL-2, CCL-5, and IL-6 promoters in TNF-α–stimulated cells (Figure 3A). However, in the presence of JQ1, the binding of BRD4 to the regulatory regions was significantly reduced, indicating that BRD4 directly regulates the expression of these genes. BET proteins recognize acetylated residues in histones, facilitating recruitment of the transcriptional activation machinery.28 Because active promoters are closely related to the enrichment of acetylated histones, the presence of acetylated histone H3 (AcH3) or AcH4 in the promoter region of these proinflammatory genes was investigated. AcH3 was more enriched in TNF-α–treated cells, consistent with the active transcription of these genes, and AcH3 enrichment was significantly reduced by JQ1 (Figure 3B). However, AcH4 levels were not enhanced in TNF-α–treated cells and were unchanged by JQ1 (Figure 3C). The JQ1 effect in renal inflammation was investigated in the unilateral ureteral obstruction (UUO) model. Inflammatory cell infiltration is one of the earliest characteristics of renal damage after UUO.40,41 The presence of infiltrating of monocytes/macrophages in obstructed kidneys was observed after 2 days and increased at 5 days (Figure 4). Treatment with JQ1 diminished the presence of infiltrating monocytes/macrophages, but only the dose of 100 mg/kg per day exerted a significant inhibitory effect (Figure 4, A and C). The immunohistochemical characterization of immune cells revealed that JQ1 significantly reduced the number of monocytes/macrophages, neutrophils, dendritic cells, and T lymphocytes in obstructed kidneys to levels similar to those of controls (Figure 4, B and D). In obstructed kidneys, renal lesions and gene upregulation of Ngal and Kim1, two biomarkers of kidney injury,40,42 were diminished by JQ1 (Supplemental Figure 3). The recruitment of inflammatory cells into the kidney is mediated by proinflammatory mediators.43 Two days after UUO, gene upregulation of Ccl-2, Ccl-5, and Il-6 was found. JQ1 treatment at 100 mg/kg per day significantly diminished proinflammatory gene overexpression (Figure 5, A and B) and protein levels as exemplified in CCL-2 (Figure 5C). 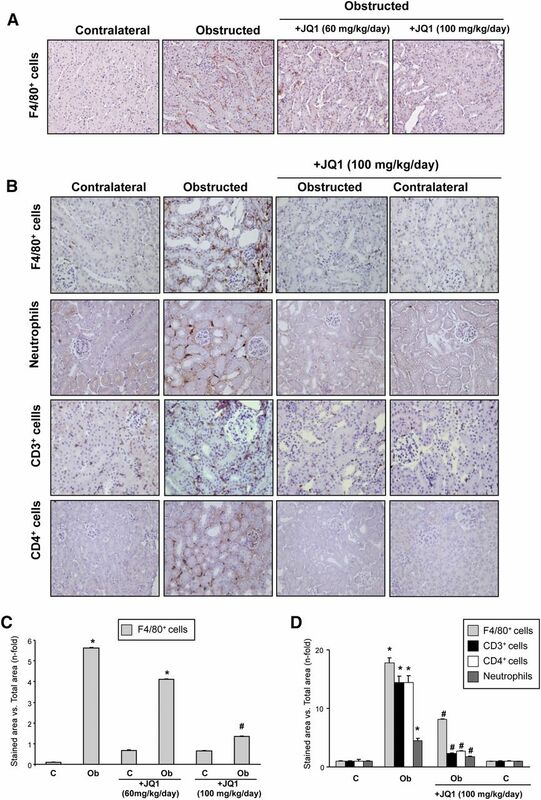 Other inflammation/immune-related genes upregulated in the obstructed kidneys were also inhibited by JQ1, including chemokines (Ccl-20 and Cxcl-16), adhesion molecules (Icam-1), and components of the NF-κB pathway (NF-κB1a) (Figure 5D). ChIP assays showed that BRD4 binding to the promoter regions of Ccl-2, Ccl-5, and Il-6 genes was significantly greater in obstructed than in contralateral kidneys. However, this BRD4 enrichment was significantly less in obstructed kidneys from JQ1-treated mice (Figure 5E). Our results show that direct binding of BRD4 to proinflammatory gene promoters and the consequent chromatin remodeling comprise a potential mechanism explaining the renal anti–inflammatory effects of BET inhibition. The experimental antiglomerular basement membrane nephritis induced by nephrotoxic serum (NTS) administration is a model commonly used to study mechanisms of human crescentic GN.44 In NTS-challenged mice, JQ1 diminished inflammatory cell infiltration (Figure 6, A and B), overexpression of proinflammatory genes (Ccl-2, Ccl-5, and Il-6) (Figure 6C), and biomarkers of renal injury (Ngal and Kim1) (Figure 6D). NTS-injected mice presented proliferation of intrinsic glomerular cells in the Bowman’s space, resulting in the rapid deterioration of renal function, resembling human pathology.44 JQ1 restored changes in renal function (as serum creatinine and urinary albumin) (Figure 6, E and F) and ameliorated glomerular lesions (Figure 6, G and H). 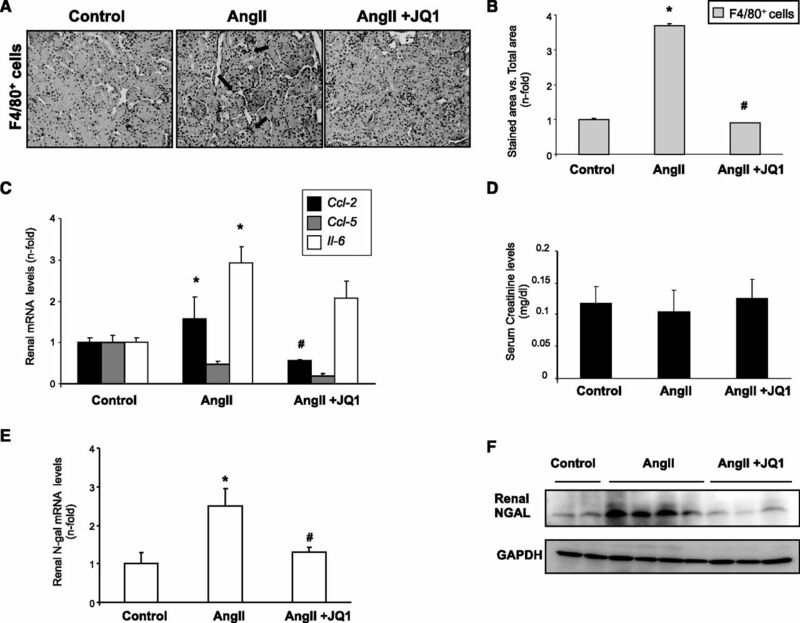 The model of systemic administration of Angiotensin II (AngII) is a nonimmune model of renal damage.42,45 As described, AngII induced an early inflammatory response; at 3 days, increased infiltrating interstitial monocytes/macrophages and proinflammatory mediators were found that were diminished in JQ1-treated mice (Figure 7, A–C). In AngII-infused mice, there was no change in renal function (evaluated by serum creatinine levels) (Figure 7D) when inflammation appeared. In contrast, Ngal gene expression and protein levels in the kidney were significantly increased in AngII-infused mice and normalized by JQ1 treatment (Figure 7, E and F). BRD4 recognizes and binds to the acetylated lysine-310 of the RelA NF-κB subunit.19,20 We hypothesized that blockade of this interaction by JQ1 might suppress the inflammatory response mediated by NF-κB pathway activation in kidney damage. NF-κB remains in the cytosol of resting cells as an inactive complex formed by p50 and RelA/p65 subunits bound to the inhibitory subunit IκBα. One of the earliest steps in NF-κB activation is the phosphorylation of IκBα and RelA.18 In HK2 cells, TNF-α increased RelA and IκBα phosphorylation, but in the presence of JQ1, there were no changes in their phosphorylation levels (Figure 8, A and B). 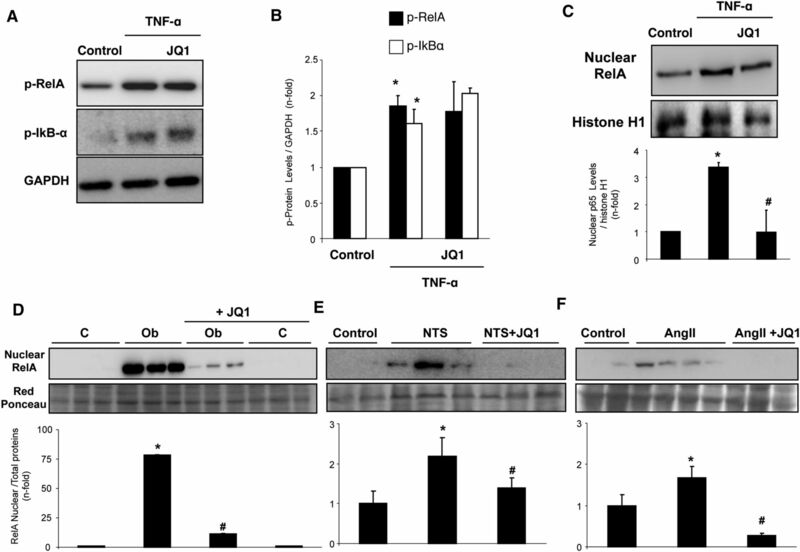 Interestingly, the nuclear levels of RelA were reduced in JQ1–treated TNF-α–stimulated cells (Figure 8C). Previous work by our group showed that activation of NF-κB contributes to the progression of renal damage in UUO and AngII infusion models.40,42,45 Blockade of RelA NF-κB activation diminished renal inflammation in those models, reducing inflammatory cell infiltration mainly by downregulating proinflammatory genes. Treatment with JQ1 produced significantly lower renal RelA nuclear levels in obstructed kidneys than in untreated obstructed ones (Figure 8D). Similarly, JQ1 diminished renal RelA nuclear levels in the injured kidneys by NTS (Figure 8E) or AngII infusion (Figure 8F). These data show that BET inhibition blocks NF-κB activation by lowering nuclear RelA levels and subsequent functional activation. Growing evidence suggests that the Th17 immune response and its effector cytokine IL-17A contribute to the pathogenesis of renal diseases, including immune and nonimmune nephropathies.46–48 In UUO kidneys, IL-17A gene and protein levels were increased and significantly downregulated by JQ1 (Figure 9, A–C, Supplemental Figure 4). Similarly, JQ1 diminished renal IL-17A production in the injured kidneys by NTS (Figure 9D). 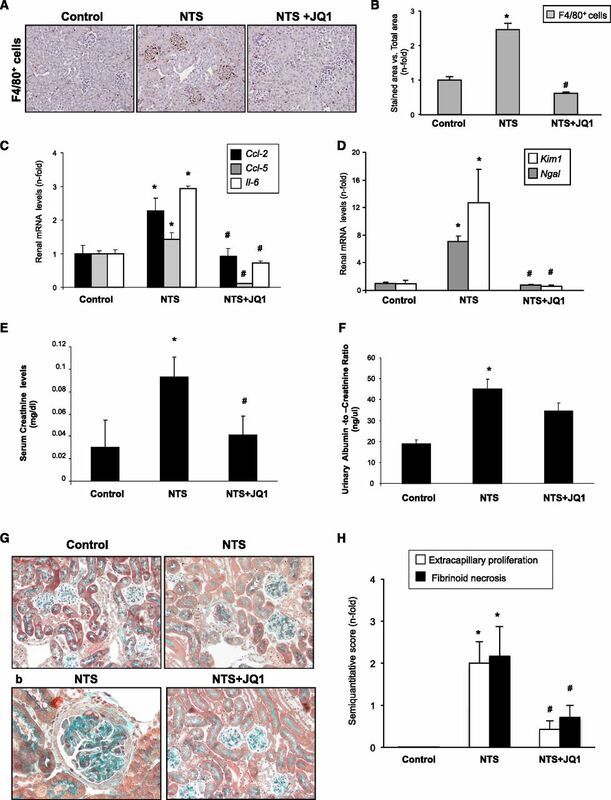 Our studies show that the specific BET inhibitor JQ1 reduces renal inflammation in different models of renal damage, including UUO and NTS–and AngII–induced renal damage. We have described that JQ1 reduces renal inflammation by several mechanisms: (1) direct binding of BET proteins to acetylated residues of H3 histone in the promoter regions of proinflammatory genes (shown in CCL-2, IL-6, and CCL-5), (2) blockade of NF-κB pathway activation by reducing RelA nuclear levels, and (3) modulation of the Th17 immune response. These results suggest that BET inhibitors could have important therapeutic applications in inflammatory renal diseases. Evidence is emerging that epigenetic mechanisms control acute inflammation. Histone acetylation and/or deacetylation are involved in NF-κB–mediated inflammation.49 Decreased H3 lysine-9 trimethylation in inflammatory gene promoters upregulates inflammatory gene expression in cells under hyperglycemic conditions.50 Several studies suggest that BET proteins regulate the inflammatory process. In activated macrophages, BET inhibitors suppress the expression of cytokines (TNF-α and IL-6) and chemokines (CCL-2), protecting against endotoxic shock.22 Moreover, BRD2 gene disruption in bone marrow–derived macrophages blunts proinflammatory cytokine (IL-6 and TNF-α) production.30 In experimental renal damage and cultured tubular epithelial cells under inflammatory conditions, we found that JQ1 reduces the expression of many proinflammatory mediators by modulating BRD4 actions. Gene silencing and ChIP assays show a key role for BRD4 in regulating the proinflammatory genes CCL-2, IL-6, and CCL-5 at the promoter level. JQ1 targeting the interaction between BRD4 and acetylated histones reduces proinflammatory gene transcription, showing that chromatin remodeling is a mechanism by which BET inhibition might impair the renal inflammatory response. JQ1 treatment reduced histone H3 acetylation without affecting histone H4, suggesting that BRD4 binding to the promoter region prevents recruitment of H3–specific histone deacetylases. Many experimental studies have shown that NF-κB blockade attenuates renal inflammation and ameliorates disease progression, including our studies in the UUO and AngII infusion model.18,41 We found in vivo and in vitro that JQ1 reduced RelA nuclear levels and thereby, NF-κB transcriptional activation, revealing a chromatin-independent mechanism involved in the anti-inflammatory effect of BET inhibitors in injured kidneys. Intensive research has unraveled the role of BET proteins in NF-κB pathway regulation, showing that BRD4 is a coactivator of NF-κB.20,51,52 BRD4 binding to acetylated lysine-310 of RelA is essential for recruiting BRD4 and CDK9 to the promoters of specific NF-κB target genes.19 Our data suggest that inhibition of BRD4 binding to acetylated RelA and subsequent NF-κB–mediated proinflammatory gene expression downregulation are other mechanisms contributing to the anti-inflammatory effects of JQ1 in renal damage. Whole–genome expression arrays in TNF-α–stimulated tubular epithelial cells showed that some NF-κB–regulated genes were downregulated by JQ1, whereas others were unchanged. Many components of the NF-κB pathway, including NF-κB1/p50, NF-κB2/RelA/p65, NF-κBIA/IκBα, RelB, A20/TNFAIP3, and TNIP1, were among the genes unaffected by this inhibitor. Previous studies have shown that JQ1 displaces BRD4 and consequently, P-TEFb from promoter regions, leading to a decrease in Pol II elongation at active genes.17 P-TEFb participates in the transcriptional elongation of a subset of NF-κB genes, whereas others are P-TEFb independent.52–54 Amir-Zilberstein et al.52 reported that NF-κB–controlled genes lacking a TATA-box sequence in their core promoters are regulated independently of the P-TEFb elongation factor. Some of our results support this hypothesis; all of the aforementioned JQ1–unaffected, NF-κB–regulated genes are TATA less and therefore, not regulated by P-TEFb and BRD4. Amir-Zilberstein et al.52 also suggested that a TATA box is a prerequisite for P-TEFb to bind to NF-κB–regulated gene promoters. However, we observed that, although several JQ1–downregulated, NF-κB–regulated genes (e.g., CCL-5, CCL-20, and IL-8) have a TATA–box core promoter, many others are TATA less (e.g., LTB, CSF2, MMP9, and CCND1). Our data suggest that JQ1 inhibited those P-TEFb–dependent, NF-κB–controlled genes by a chromatin-independent process but mediated them by direct effect on RelA/p65 levels. Our in vitro data showed that JQ1 only reduces RelA nuclear levels, without affecting the basal or phosphorylated levels of cytosolic NF-κB proteins. Moreover, JQ1 preferentially inhibits the upregulation of proinflammatory genes under NF-κB control, whereas key NF-κB pathway components, such as NF-κB1/p50, NF-κB2/RelA/p65, NF-κBIA/IκBα, RelB, and A20/TNFAIP3, were unaffected. These data are consistent with the observation that TNF-α stimulation induced acetylated lysine-310–dependent recruitment of BRD4 to the promoter of proinflammatory genes, with no effect on A20/TNFAIP3 expression.19 Our results suggest that inhibiting the acetylated RelA/Brd4 interaction with BET-bromodomain inhibitors may provide a novel pharmacologic strategy to block NF-κB activation in inflammatory renal disease. This strategy may have more selective anti–inflammatory effects than using NF-κB kinase inhibitors or proteasome-targeted drugs. Studies of genetically modified mice or using neutralizing antibodies against IL-17A or its receptor have shown the involvement of Th17 immune responses in chronic inflammatory diseases,55–60 including immune and nonimmune experimental renal damage.47,48 The presence of Th17 cells in UUO-damaged kidneys has been described.47,48 We have confirmed this observation, detecting IL-17A+ cells by immunohistochemistry and upregulation of IL-17A mRNA and protein. Treatment with JQ1 practically abolished kidney IL-17A levels in UUO and NTS-induced nephritis. BRD4 and BRD2 bind directly to the chromatin in the CNS2 regulatory region of the IL-17a gene controlling its expression.59 In vitro, other Th17–related cytokines, such as CCL-20 and CSF-1, were downregulated by JQ1. Moreover, BET inhibition suppresses Th17 differentiation from human and mouse naive CD4+ T cells and the activation of previously differentiated Th17 cells.16 Accordingly, BET inhibition protects against development of collagen-induced arthritis and experimental autoimmune encephalomyelitis caused by the impaired generation and function of Th17 cells.59 Our results expand the strategies for neutralizing IL-17A–mediated inflammatory effects in the kidney by using bromodomain inhibitors. During renal damage, various extracellular signals promote rapid induction of proinflammatory gene expression by activating and recruiting transcription factors and/or transcriptional coactivators to the promoter regions. Our findings highlight the importance of BET proteins in regulating the inflammatory response in the kidney, where they act as epigenetic readers that recognize acetylation marks in histones and other proteins, including transcription factors (as described for NF-κB). Additionally, BET proteins help regulate the mammalian transcription complex that initiates the transcription of proinflammatory genes. Our data show that blocking BET protein bromodomains with small molecule inhibitors, such as JQ1, might be a powerful therapeutic strategy for inflammatory renal diseases. These findings identify BRD4 as a critical genomic regulator of renal inflammation and provide mechanistic insights into the intrinsic epigenetic vulnerabilities of inflammatory disease that can be exploited for pharmacologic intervention. The model of UUO was established in male C57BL/6 mice under isoflurane-induced anesthesia as described; the left ureter was ligated with silk (5/0) at two locations and cut between ligatures to prevent urinary tract infection (obstructed kidney).40,47 Some animals were treated daily with JQ1 from 1 day before UUO and studied after 2 and 5 days (n=6–8 mice per group). At the time of euthanasia, animals were anesthetized with 5 mg/kg xylazine (Rompun; Bayer HealthCare, Whippany, NJ) and 35 mg/kg ketamine (Ketolar; Pfizer), and the kidneys were perfused in situ with cold saline before removal. Studies compared both kidneys (contralateral versus obstructed) in each mouse. Kidneys were further processed for immunohistochemistry (fixed and paraffin embedded) or ChIP assays (fixed in 1% formaldehyde followed by quenching with 0.125 M glycine) or snap frozen in liquid nitrogen for RNA and protein studies. The model of systemic infusion of AngII was done in C57BL/6 mice subcutaneously (ALZET Osmotic mini-pumps Model 2001; Alza Corp., Palo Alto, CA) at the dose of 1000 ng/kg per minute for 3 days as described.42,45 Some animals were also daily treated with JQ1 from 1 day before AngII infusion. As control, saline infusion was done. The accelerated NTS nephritis was produced in male C57BL/6 mice using antimurine glomerular basement membrane rabbit antiserum as described.44 Mice were injected with 50 μl NTS diluted 1:10 in sterile saline on day 1. Then, mice were injected with 4 μl/g body wt on days 2 and 3, and they were studied 10 days later. Some animals were also daily treated with JQ1 starting 1 day before the first NTS administration. The renal lesions were evaluated by Masson staining. Extracapillary proliferation ratio was calculated by counting injury and normal glomeruli (60–70 glomeruli for each renal sample). The proportion of pathologic glomeruli was evaluated by examination of at least 50 glomeruli per section by an examiner masked to the experimental conditions. Human renal proximal tubular epithelial cells (HK2 cell line; ATCC CRL-2190; American Type Culture Collection, Manassas, VA) were grown in RPMI 1640 medium (Gibco, Carlsbad, CA) as described elsewhere.42 JQ1 and its enantiomer (−)JQ1 (Selleckchem), the latter used as the nonactive control, were dissolved in DMSO (0.25%). Cells were maintained in serum-free medium for 24–48 hours before experiments. Subconfluent HK2 cells were transfected with 40 nM Dharmacon ON-TARGETplus Human BRD4 (L-004937) SMARTpool siRNA using DharmaFECT 1 Transfection Reagent (Dharmacon). As control, a nonspecific scrambled siRNA was used. Cells were then incubated in serum-free medium for 48 hours before stimulation. Knockdown of BRD4 was validated by quantitative RT-PCR. Paraffin–embedded kidney sections (5 μm) were stained using standard histology procedures as described elsewhere.47 Briefly, sections were incubated for antigen retrieval (PTlink System; Dako) followed by blockade of nonspecific bindings, incubated with primary antibodies and biotinylated secondary antibodies, and developed by standard procedures. The specificity was checked by omission of primary antibodies. The positive-stained areas were assessed in 10 randomly chosen fields (×200 magnification) using Image-Pro Plus software. Data are expressed as the positive-stained area relative to the total area. The primary antibodies used were myeloperoxidase, CD3, CD4 (ready to use; Dako), and F4/80 (1:50; Serotec). Total protein samples for frozen renal tissue were isolated in lysis buffer as described45 or NE-PER Reagent (Pierce, Rockford, IL) to obtain nuclear and cytoplasmic fractions. Proteins (20–100 μg per lane; quantified using a BCA protein assay kit) were separated on 8%–12% polyacrylamide-SDS gels under reducing conditions as described.47 The quality of proteins and the efficacy of protein transfer were evaluated by Ponceau Red staining (not shown). The following primary antibodies were used: p-p65 (Ser536; 1:500; Cell Signaling Technology, Danvers, MA), p65 (Sc-372) (1:500; Santa Cruz Biotechnology, Santa Cruz, CA), p-IκBα (Sc-8404) (Ser32; 1:500; Santa Cruz Biotechnology), BRD4 (1:2000; A301–985A; Bethyl), tubulin (1:5000; Sigma-Aldrich, St. Louis, MO), histone H1 (Sc-8030) (1:500; Santa Cruz Biotechnology), β-actin (1:10,000; A5441; Sigma-Aldrich), and GAPDH (1:5000; Chemicon International). Total RNA from cells or frozen renal tissue was isolated with TriPure Reagent (Roche, Basel, Switzerland). cDNA was synthesized with a High-Capacity cDNA Archive Kit (Applied Biosystems, Foster City, CA) using 2 μg total RNA primed with random hexamer primers following the manufacturer’s instructions. Next, quantitative gene expression analysis was performed by real-time PCR on an AB7500 Fast Real-Time PCR System (Applied Biosystems) using fluorogenic TaqMan MGB Probes and primers designed by Assay-on-Demand gene expression products (Table 1). Data were normalized to GAPDH RNA expression. The mRNA copy numbers were calculated for each sample by the instrument software using the Ct value (arithmetic fit point analysis for the lightcycler). Cells (107) were fixed with 1% formaldehyde (Sigma-Aldrich) followed by quenching. DNA fragments 500–1000 bp long were generated by shearing chromatin on a BioRuptor (Diagenode). The shared chromatin was incubated with BRD4 antibody (A301–985A; Bethyl) or normal rabbit IgG (negative control; Upstate Biotechnol-ogies Inc.) and recovered with protein A-agarose/salmon sperm DNA (Upstate Biotechnologies Inc.). After reversal, crosslinked, and proteinase K treatment, DNA was extracted and analyzed by quantitative RT-PCR with specific primers (Table 2). Relative enrichment was calculated as the percentage of input DNA for each sample using the formula % input =2 exp[(Ct [unbound] − log2 [unbound dilution factor]) − Ct (bound)] ×100 and normalized to normal rabbit IgG antibody (considered as one). ChIP assays in kidney samples were produced using the High Cell ChIP Kit (Diagenode) following the manufacturer’s instructions using specific primers (Table 2). Results were shown as the n-fold enrichment of anti-BRD4 antibody over a negative control antibody (normal rabbit IgG). Total RNA was isolated using the RNAqueous Micro Kit (Ambion) according to the manufacturer’s instructions. RNA quality and quantity were assessed using an Agilent 2100 Bioanalyzer (Agilent Technologies, Santa Clara, CA) and a fluorometric Qubit 2.0 Assay (Invitrogen, Carlsbad, CA), respectively. RNA was hybridized to an Illumina Expression Array HumanHT-12, version 3. Expression data were analyzed using R packages from the Bioconductor project (www.bioconductor.org) and lumi packages.61 For the detection of differentially expressed genes, a linear model was fitted to the microarray data, and empiric Bayes moderated t statistics were calculated using the limma package of Bioconductor.62 Genes with a >1.5-fold change and adjusted P<0.05 were considered significant according to the technical specifications of Illumina. For gene functional analysis of the differentially expressed genes, we used the DAVID Go Web–based tool.63 The raw gene expression data have been submitted to the NCBI Gene Expression Omnibus under accession number GSE71602. Serum creatinine levels were determined by the Biochemical Analysis Service at Fundacion Jimenez Diaz Hospital, and data are expressed as milligrams per deciliter. Urinary concentrations of albumin were normalized by creatinine concentrations in individual mice samples. Urinary creatinine levels were determined by the Creatinine Assay Kit (ab65340; Abcam, Inc., Cambridge, MA). Albumin excretion levels were determined by using a mouse Albumin ELISA Kit (ab108792; Abcam, Inc.). Albumin-to-creatinine ratio was expressed as nanograms per microliter. Results are expressed as the n-fold increase with respect to the control as the mean±SEM. In mouse studies, data were obtained comparing both kidneys (contralateral versus obstructed) in each mouse. Mean results from untreated contralateral kidneys were taken as reference values (control). Differences between groups were assessed by the Mann–Whitney test. Statistical significance was concluded for values of P<0.05. These analyses were done using SPSS, version 16.0 (IBM SPSS, Chicago, IL). The bromodomain and extraterminal inhibitor JQ1 was provided collaboratively by Dr. James Bradner (Dana-Farber Cancer Institute, Boston, MA). This work was supported by the Instituto de Salud Carlos III and Fondo Europeo de Desarrollo Regional grants PI014/0041, PI13/00047, and PI12/02587; Red de Investigación Renal grants RD12/0021/0002, RD12/0021/0021, RD12/0021/001, and RD16/009; Comunidad de Madrid Fibroteam grants S2010/BMD-2321 and S2010/BMD-2378; Plan de Ciencia, Tecnología e Innovación 2013–2017 del Principado de Asturias, grant GRUPIN-14-030; and the Instituto Reina Sofía de Investigación en Nefrología. B.S.-A. was supported by Sara Borrell, A.B.S. was supported by Miguel Servet, and A.O. and C.L.-L. were supported by Intensificación Instituto de Salud Carlos III. B.S.-A. and J.L.M.-P. contributed equally to this work. This article contains supplemental material online at http://jasn.asnjournals.org/lookup/suppl/doi:10.1681/ASN.2015080910/-/DCSupplemental.